State forests are usually on the seller’s side and, therefore, it is important for them to have a good overview of the volume and assortment of the products they’re selling. Using the traditional method of measuring pulp and fuelwood has always been a subject of many disputes and disagreements, mainly for the reason that the volume of pulp and fuelwood is usually calculated by using a pile density coefficient, a quick method but with a high-error margin of: 5-10%. Pile density coefficient is traditionally decided simply by visual observation. It determines the timber amount without air and bark. To get the total volume, the chosen pile density coefficient is multiplied with the cubage of the pile. If the coefficient is 50, the price to pay is: 0.5×60 (volume) x 30 (price) = €900. In addition, it is impossible to re-measure or prove any faults later as the truck is already unloaded. Today, Estonian and Lithuanian State forest management centres are using Timbeter’s function to assess pile density coefficient automatically for measuring pulp and fuelwood accurately. In the past, 55% of the trucks carrying pulp and fuelwood in Estonia were measured via pile density. 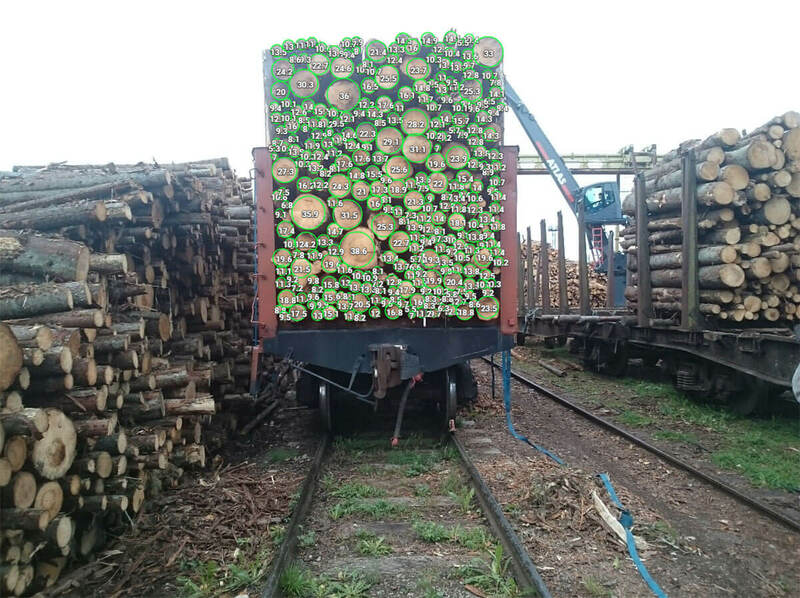 Later, Estonia’s State Forest Management Centre – RMK – supply chain was digitalized, except for the pile density coefficient that was still manually entered according to the truck driver’s visual estimate and caused several disputes between buyers and sellers. Nowadays, Estonia’s State Forest Management Centre e-waybill and storage systems are integrated with Timbeter. Truck-drivers simply take pictures and the useful information automatically goes to the e-waybill. Every measurement has digital proof which contains information about the pile density coefficient, volume, location, number of logs, average diameter and diameter distribution. In Lithuania, counting inventories had to be carried out on a monthly basis and this is a time-consuming process. Counting and measuring each pile log-by log was inefficient and required a lot of manpower. Today, Timbeter is integrated with the Lithuanian State Forest’s storage system, therefore all the required information is available in digital form. Inventories are counted and measured quickly, precisely and efficiently. In addition, all the measurements include digital proof. Timbeter is an objective tool that’s not impacted by human error. It provides the user with a result that can be controlled by both parties of the transaction. Transparent measuring method helps to increase mutual trust between partners and improve the partnership. Typically, assessing pile density visual observation is subjective and open to a high risk of human error. Timbeter provides digital proof of every taken measurement, that can be stored and retrieved online in case of a dispute between transaction parties. Timber measurements are always taken from raw timber that has not been altered in any ways. Furthermore, it helps to prevent situations, where the stronger party dictates the pile density coefficient and the subsequent weaker party cannot disagree for the sake of maintaining cooperation. Digital information enables multifunctional data use, decreases bureaucracy and the use of paper resources. By using Timbeter, all data is backed-up, stored and available online. Users can access, manage and share data easily. Also, Timbeter can validate the pile density coefficient by measuring the average diameter, using a measuring stick as reference. Within a couple of minutes from taking the measurement there’s data available for 30 days which makes it easy to retrace the measurements and compare it to the sold or bought product. Timbeter’s goal has been from the beginning to make the forestry departments paper-free, transparent and more effective. We are happy to put our vision into reality in Estonian and Lithuanian State Forests.